Dental implants are the standard of care for replacing missing teeth. Nothing in dentistry will last longer or work better than dental implants when replacing missing teeth. Dental implants were designed from the root up to the crown. That is dental implants are anchored in the jawbone just like natural teeth. 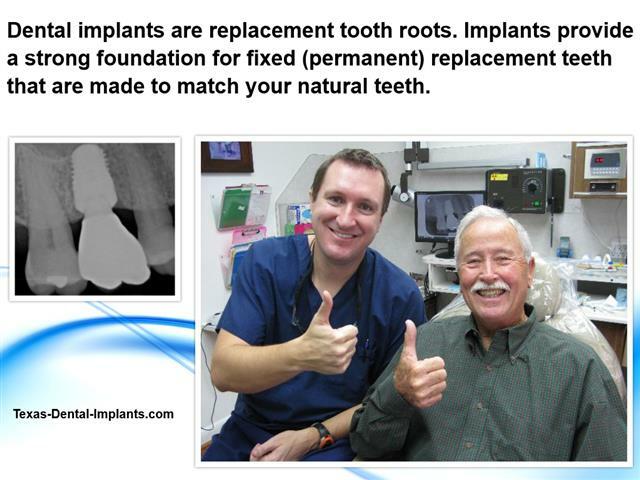 In fact, Dr. Nugent’s patients say they cannot even tell they have a dental implant. Dental implants are a conservative treatment plan. With dental implants no adjacent teeth need to be damaged. Bridges require the dentist to grind away healthy tooth structure. The only teeth replacement option that preserves bone is a dental implant. Chewing forces are distributed down the implant where the bone is stimulated and preserved. With outdated teeth replacement options bone is lost. The lack of bone contributes to wrinkles and a gaunt appearance as the facial structures collapse into atrophied areas. 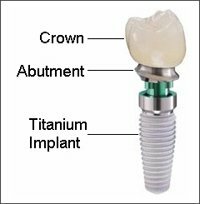 Dental implants are composed of three parts: implant, abutment and porcelain crown. The titanium implant is inserted into the jawbone. Once the bone fuses to the bone the abutment is screwed into the abutment and will serve as the foundation for the crown. Lastly, a beautiful cosmetic porcelain crown is made to fit over the abutment. The patient will brush and floss the restored dental implant just like a natural tooth. Dr. Nugent practices dentistry in Pasadena, Texas. Dr. Nugent focuses on Cosmetic, General, Implant and Sedation Dentistry. Patients from Pasadena, Deer Park, La Porte, League City, Friendswood, Clear Lake and Houston Texas trust Dr. Nugent for their dental implants. Let the experience and passion of Dr. Nugent work for you. Dr. Nugent’s patient was missing a front tooth. 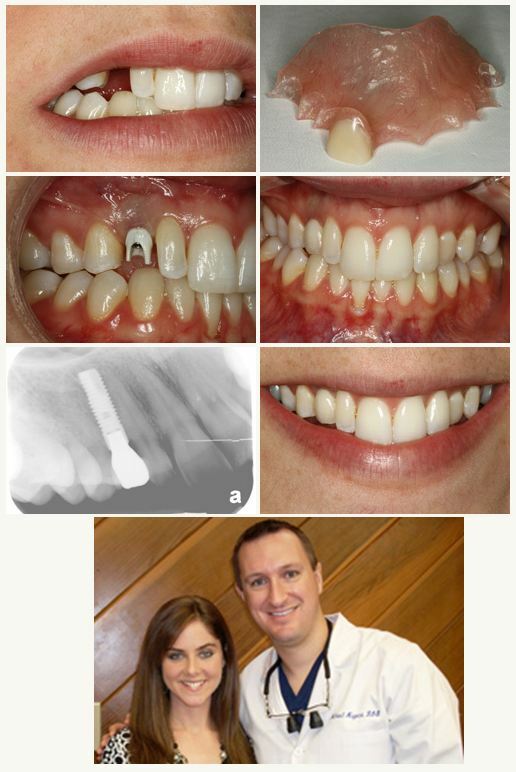 She wore a bulky plastic partial denture to replace the missing tooth. She researched her options and picked Dr. Nugent for her cosmetic demands. A dental implant was chosen as the best option. Once the implant was fused with the bone Dr. Nugent placed a white zirconia abutment followed by an all porcelain crown. The results were amazing. The patient was extremely satisfied with her new beautiful smile. 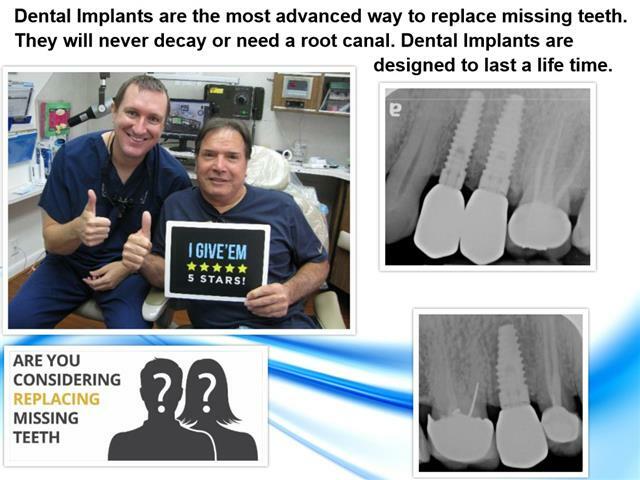 Dental implants are a true passion of Dr. Nugent. He loves talking about the many advantages of dental implants. Call our office at 713-941-8261 to schedule an appointment with Dr. Nugent. Or call us at 713-941-8261.